Austria’s may only have a very slim piece of the massive Lake Constance shoreline, but she certainly makes the most of it. Very active and scenic, Bregenz (BRAY-guhnts) is the largest town on this \stretch. It is a town proud of its role as a cultural capital of western Austria, and as a gateway for outdoor activities due to its proximity to the 3,000 foot tall Pfänder Mountain. The Bregenz tourist maps were excellent — I procured one traditional city map, and a detailed city guide that together made it easy for me to plan an itinerary. 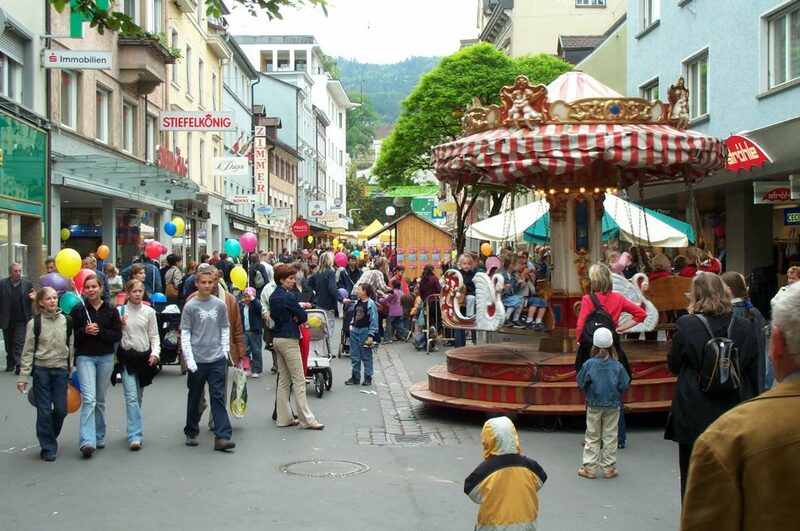 I had the wonderful opportunity to visit Bregenz during a Kinderfest, or children’s festival, that spread all throughout the downtown. The photo below shows how crowded it was, filled with rides, activities, food and drink. Most of the booths raised funds for charities or local youth clubs or activities. This festival ran nearly all day, and was a pre-cursor to the city Spring Festival that began the following weekend. Indeed, there were advertisements for several future events, and the Bregenz city calendar was jam packed with events. For example, I took note of a “New Orleans” Jazz Festival that would be held June 2003 that listed over two dozen jazz artists who would perform. As I walked the downtown (trying to avoid tripping over the kids in the process), I found it to be a mix of old and new, with the old-style architecture and decor being very interesting. 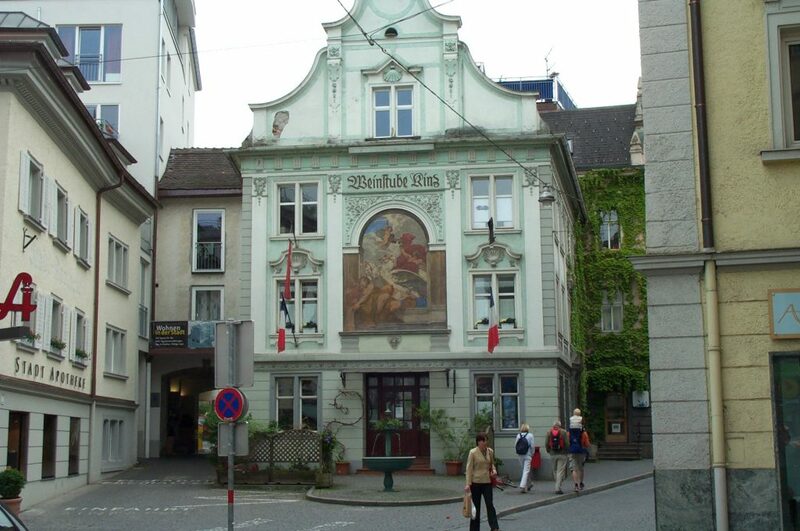 The Weinstube Rinz, shown in the next photo, was distinguished by its beautiful facade. The white Nepomukkapelle was a very small rotunda that the tourist map called the “Baroque jewel in the heart of the city”. The current Town Hall and Lake Chapel (Seekapelle) were connected together with their old-fashioned gray concrete exterior graced with bright copper-green domes. Speaking of churches, Bregenz had several prominent churches and monasteries, with a number of them having been recently rebuilt or restored. One example was the yellow-brick Church of the Sacred Heart (Kirche Herz-Jesu) that was the dominant structure downtown. It was heavily damaged during one of the World Wars but has been fully restored and looked brand new from the inside. Higher up, on a hillside adjacent to the Old Town, was the St. Gallus church (below) with a fabulous WWII monument next to it. St. Gallus faces the Kapuzinerkloster, an old monastery that became inactive and fell into disrepair centuries ago. But it has been restored and converted to a convent with the help of significant local investment. 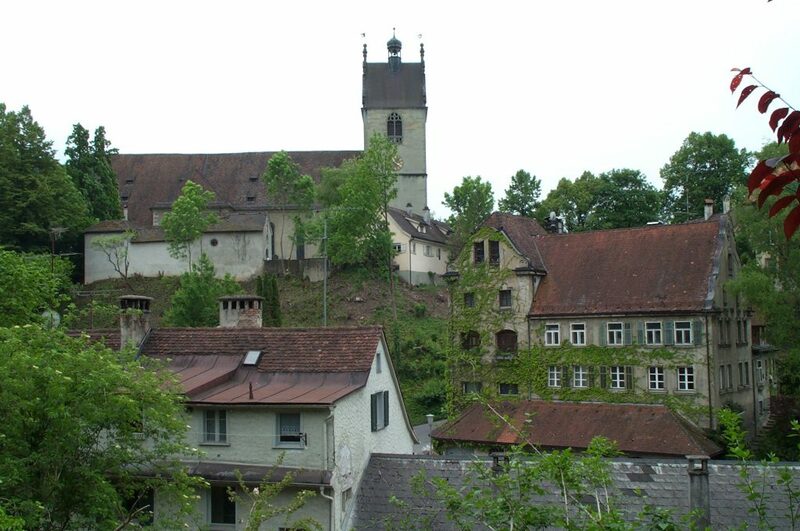 The Old Town (Oberstadt), was unusual in its total physical separation from the rest of the town on a high plateau. This was understandable given a sign I saw at lakeside showing the high water marks for the lake since the 19th century — a couple times Lake Constance swelled to the point of submerging the current harbor! 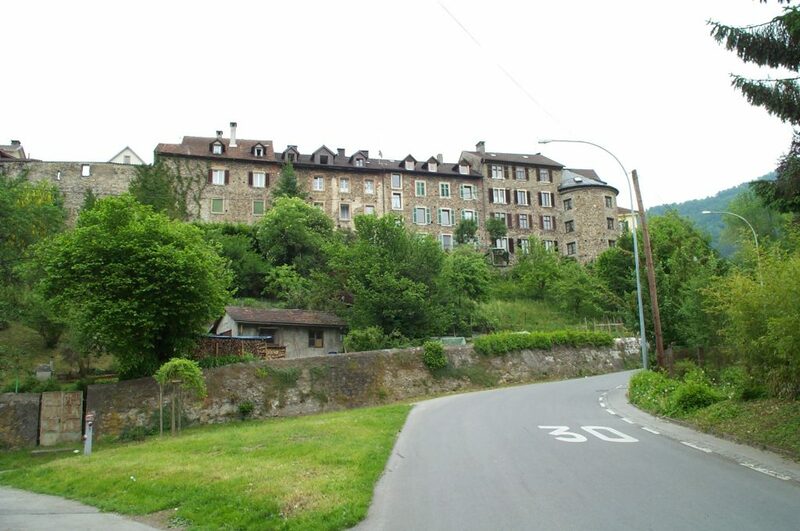 Currently, the Oberstadt is residential, but there are several interesting landmarks. The biggest one is the Martinsturm, a Turkish-looking square tower at the northeast corner with a direct view of the lake. The Martinsturm is a military museum and vista built on top of an old church. The church itself is fascinating with its some of its old frescoes still intact inside. The Dreuserschlossl was located at the southwest corner, and now serves as a guesthouse and restaurant. The classic Old Town Hall (altes Rathaus) was a huge yellow A-frame with distinctive white-and-red shutters. Bregenz has also modernized quite a bit, with the lakeside being built up with current-day steel-and-glass structures. Among them were a number of above-ground dance clubs and bars with glass walls to allow people a perfect view of the surroundings. The lakeside district is very modern, and The Old Town provides for a very pleasant walk. The fifth photo shows the main harbor at the northeast end of town. 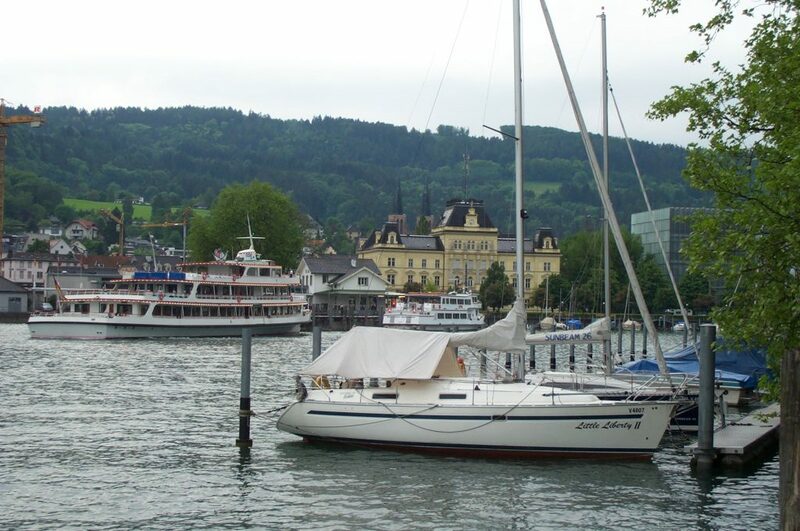 The passenger liner at left was pulling out, ready to head for Lindau am Bodensee, just a half-hour ride away. Passenger liners run continuously during the summertime, taking people just about anywhere on Lake Constance. Given the limited train and roadways, crossing the lake by boat can be the most convenient way to go! Just be careful crossing into or out of Switzerland as you will need your passport. The large yellow building in the background is the Old Post Office, one of Bregenz’s proud architectural landmarks. The other major lakeside landmark is the city convention center and Lakeside Theater on the western shoreline. The Lakeside Theater was very interesting with its floating stage that had a really wild set build on it for “West Side Story”. Nearby there was a casino, an outdoor swimming pool, and a sports complex complete with local stadium. In between these landmarks was a park with several vistas (including a gazebo built in the lake), restaurants and cafés, and a small harbor where one can rent paddle boats. The one part of my trip that proved disappointing — due to weather — was my gondola ride up the mountain. The Pfänderbahn is a very comfortable six-minute ride straight up the mountainside to a beautiful vista and restaurant. Nearby, there is an eagle observatory where trained falconers hold two ‘birds of prey’ performances daily for a small fee. There is also a game and wildlife park and a number of a mountain trails popular for hiking. Unfortunately, a very dense bank of fog and heavy cold rain swept in during the ride up the mountain, obscuring my view enough that taking pictures was impossible. It got so bad that it was worth staying up very long. A shame, because I caught enough of the lake view to know that on a clear day, it would be very much worth the trip. Indeed, because Bregenz is in an ideal location, I may get that chance. It sat on the ideal route from Lake Constance into Western Austria, eastern Switzerland, and Liechtenstein. It was loaded with nice hotels and restaurants without the tourist kitsch or overpricing that I encountered in nearby Lindau (which was only a ten-minute train ride away). I enjoyed my visit there, and hopefully next time I’ll get better weather.